The Matilija Poppy is a beautiful spring flowering plant that reaches 3'-5' high and spreads to 8' or more, growing from rhizomes. Gray-green foliage provides a back-drop for the spectacular spring flowers that can reach 6" across. 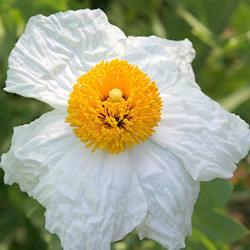 The white papery petals, with a bright yellow center give this plant its other common name; Fried Egg Plant. This has the largest flower of all the native flowers and was once the state flower before it was superseded by the more common California Poppy.This plant naturally grows alongside dry stream beds in well-draining sandy soil. We recommend cutting this plant back to about 4"-6" after flowering. It will remain dormant until the next rainy season and put on spectacular growth in the early spring, ready to provide it's superb flower show again in April and May. The delicately scented flowers make a short-lived but spectacular indoor vase arrangement. Bees, birds and butterflies all enjoy this unusual plant. I have grown this plant in my garden in Centennial, a suburb of Denver, Colorado for the past three years. Planted in the spring after having purchased it in the previous Fall, it is planted on an open, northeastern-facing slope. It has flowered and suckered as well. Last year, my power utility had to replace an underground cable and overran both plants with a powered trencher. To my pleasant surprise, both the original plant and its suckered offset grew back without difficulty. this plant is hardy to at least zone 5 and temperatures well below zero for extended periods of time.